Children love to sing and ring! Our Children's Choir (children ages 7 and older), resumes practice in September. We gather at 11 am, immediately after Sunday worship service, to practice in the Music Choir Room. 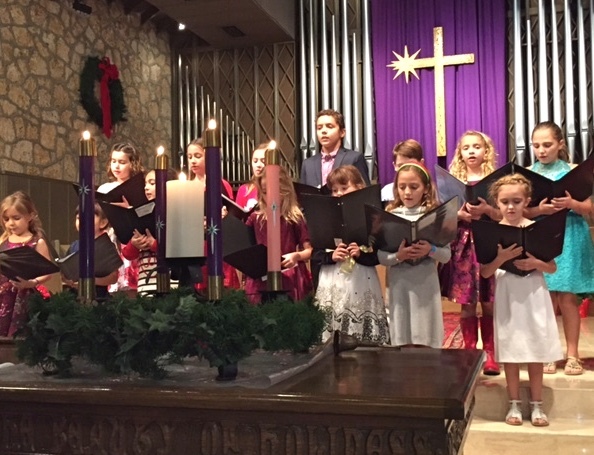 The Children’s Choir participates in special services (Hanging of the Greens, Christmas, Palm Sunday, Mother’s Day) and occasionally in regular Sunday worship services. For more information, please contact Dr. Mary Adelyn Kauffman, Organist and Dir. of Music, or call the Church Office: 305-444-6521.